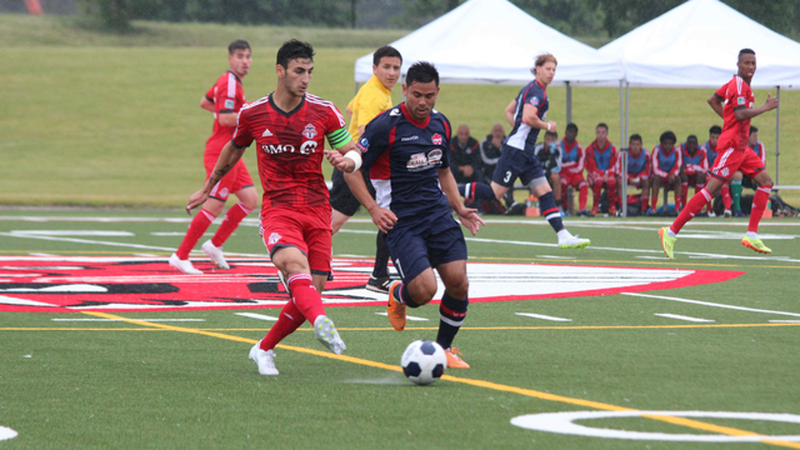 From the opening kick-off, TFCA looked to build from the back and attack, while Vaughan appeared content to play a counter game. In the initial going it proved to be an effective strategy for the Azzurri. After TFCA had enjoyed almost all the ball for the first eight minutes a seemingly harmless play down the right flank was pounced on by Andrea Lombardo. The big forward used his size advantage to perfection, overwhelming the TFCA fullback and sending a perfect cross into former TFCA product Jonathan Lao. He would make no mistake against his former club, hammering the ball into the waiting net for a 1-0 Vaughan lead in the ninth minute. Eleven minutes later Lombardo was at it again. Another soft pass was pounced on for the turnover. Sending a looping cross towards the left side if the eighteen, Lombardo picked out a streaking Dena Iezady who finished off a single touch. With only two real chances, Vaughan had charged ahead 2-0 in twenty minutes and TFCA's undefeated 6-3-0 record was in jeopardy. However, head coach Michael Stefano stressed that his young players never panicked. "These are young professionals," he said following the game. "Sometimes you have a slow start and you have to know how to react in a positive way. "We never got away from our game plan... we play the way we know how to play." The way TFCA knows to play is by playing from the back and utilizing the skill of the central midfielders to create space, and send crisp passes to space. That's exactly what happened in the thirty-third minute. Marco Rodriquez perfectly weighted a pass to Marcos Anthony Nunes, who made a perfect run behind the left full back. From there Nunes held composure to force the keeper to ground and finished in the open net. It was 2-1 and the comeback was on. Three minutes later it was complete. This time it was Mark Anthony Kaye that worked the midfield magic, looping a skilled thirty-yard pass to the feet of a charging Nunes. In alone, he made no mistake and the game was tied. It would be one of the goals of the year that would give TFCA the lead. With both teams seemingly looking to get to the break on even terms, Dylan Sacramento looped a ball towards the Vaughan back line. It appeared to be an easy clearance for the defender, but suddenly league leading scorer Molham Babouli found another gear. With a burst of speed no-one in the stadium could anticipate, he managed to he get his head to the ball and perfectly lob the helpless goalkeeper. Even the Vaughan fans had to applaud this fantastic piece of skill that put TFCA up 3-2 heading into the break. Just four minutes into the re-start TFCA got the insurance goal. Sacramento went on a thirty-yard run to the touch line, and was able to direct an unopposed pass to Nunes, who fired home for his hat-trick. It was a great finish, but once again it was the midfield that was the driving force for the Young Reds. From there the game became cagey with TFCA happy to use possession to kill the clock. A breakdown in the seventy-fourth minute gave Vaughan a free kick on the edge of the box. Lao would convert on the ensuing scramble to make it 4-3, but that was as close as it would get. The game's last fifteen minutes were a chippy affair, with several cards flashed. Included in that discipline count was Vaughan head coach Carmine Isacco, who was shown red for arguing with the referee.